The name of this corporation will be SALINE PRESERVATION ASSOCIATION, hereinafter referred to as SPA. SPA wishes to promote an atmosphere of welcome to all visitors while communicating the valley's traditional lifestyle to newcomers. SPA intends to represent the community, to be a sounding board, between the members and the Park. SPA intends to accomplish this by supporting cooperation and helpfulness, to promote a mutually beneficial partnership. SPA will focus its activities on the watershed defined by the crests of the Inyo Mountains, Last Chance, Nelson, Panamint and Saline Ranges and entry routes from surrounding paved roadways. SPA will not align itself with other organizations except on a case-by-case basis where the Board determines that it is in the community's best interest to do so. SPA, in cooperation with the Camp Host, will maintain the Saline Valley Warm Springs area and facilities with the efforts of volunteers. Maintenance projects will be identified as needed through communications between the Camp Host, SPA and the NPS. 1. Non-Voting Membership is evident (in effect) when any person emails their request to SPA’s designated website administrator at the designated email address. a) Non-Voting Membership does not require disclosure of any additional information (beyond the email address) for the Non-Voting type of membership and typically may be used for e-communications from the SPA Board in the form of a newsletter or e-link to same. b) Non-Voting members define the SPA Forum Database. a) Making a written request to be added to SPA by mail (USPS). b) Making an in-person (face to face) request to any SPA Board member. c) Making a donation to SPA via PayPal where the Voting Member's address (USPS) is specified - PayPal donations typically contain the donor's address (for reference) together with their e-mail address. d) Voting members define the SPA Membership Database. 3. Voting Member's e-mail address will define the method used during Board election events and may be used for e-communications from the SPA board in the form of a newsletter or e-link to same. a) Voting members who have no e-mail address will no longer be contacted by regular mail (USPS). It is up to the "eligible voting member" to provide a valid email address to continue to be a voting member, and still provide a valid (USPS) address by one of the methods defined in "Voting Membership" above. 4. All members are expected to adhere to the provisions as stated in these Bylaws. 5. All members are responsible for their actions at all organizational functions and when on site in Saline Valley and are expected to promote the well-being of the Association. 6. Revocation of any SPA membership may be effected for due cause by an action of the full SPA Board. 7. The Bylaws approval process is initiated when the SPA Board votes to amend the existing bylaws. The “amended bylaws” are then e-mailed to the SPA membership to be approved via an e-mail vote. SPA members will be given two weeks to respond via e-mail to accept or reject proposed changes. The SPA Board will post results 15 days after the closing period. 1. An eligible voter is a member who is in the current active Membership Database. In order to avoid politicking at the springs, which is contrary to SPA's furthering of peace and harmony, any election held can take place at any time with all voting done via verifiable email ballots, except for Voting Members who have no email address, see above. a) Four members of the seven-member SPA Board may call for an election. 2. Ten percent of the current active members may petition the Board to hold a community election on any subject. Signatories will be qualified by being in the SPA Membership Database. 3. If the issue is Board membership, all members must stand election. The Board will ask that all candidates send in a short bio and reason to be on the SPA Board thru the website. No member of the Board may serve on this committee. Any member may become a candidate by notifying the Nominating Committee. The Nominating Committee is not precluded from nominating one of its own. 4. Elections for the SPA Board shall not be held more frequently than once every 24 months. 5. Ballots shall be sent within an e-newsletter which shall contain an explanation so members may vote from a position of knowledge. If the issue is to determine consensus regarding an issue other than Board membership, supporters and detractors of each issue shall be given equal space in the newsletter. 6. No written materials may mention any candidate or Board member in an untruthful way. 7. Election materials may not exceed 50 percent of a newsletter and preferably should be less. 8. Ballots shall be sent to all verified email addresses contained in the Association's membership database. They shall be included within a newsletter following the presentation and validation of a petition for election or Board vote for such. All ballots will carry clear instructions as to where members are to return the ballots and what is the last date upon which they may be received. 30 shall be provided for the return of ballots, based upon the date of the Association's e-mailing of the ballots. 9. One ballot will be sent to each SPA Membership. If more than one member resides at that physical address, copies of the ballot may be made and one ballot submitted by each member. All voters’ names must appear on the SPA Membership Database. Copies of the ballot must be included for each voter for individual votes to count. Cumulative voting is not allowed. Ballot forms will be sent by e-mail, may be printed out and returned by regular mail or e-mailed to the Board. The envelope/e-mail containing the ballot form must show the name and physical return address of the voter. 10. Ballots shall be returned postpaid by the member in an envelope supplied by him/her, with his or her name on the outside as it appears on the original ballot sent. Multiple ballots being returned by members who share the same physical addresses should clearly show both/all members’ names in the return address. All names will be verified as members, based on the SPA Membership Database, before the envelopes are opened and ballots are separated into an anonymous collection for counting. 11. The Board will give results to any/all candidates, within 15 days. 12. If a new Board is formed by election (one or more new members) that Board will endeavor to assemble at the earliest opportunity to address the future well-being of the Association. 1. MEETINGS. Community meetings of the members may be held if the Board identifies a circumstance where the community would be best served by an assembly, or a significant number of the members express such a need. 2. AUTHORITY. The members have the exclusive right to decide the policy of the Association in conformance with applicable statutes, the Articles of Incorporation, and the Bylaws of the Association. The members’ policy decisions charge the Directors with the duty to carry out those policies and authorize them to conduct the business of the Association as reasonably needed to accomplish those policies. 1. The SPA Board will consist of seven members. Four members constitute a quorum, of which a majority of three will decide. 2. If a Board member resigns, the resigner will be encouraged to nominate his/her replacement with confirmation by a vote of three Board members including the resigner. 3. The Board may remove a Board member by a vote of four, or by calling for an election. 4. Officers and meeting chairpersons shall be appointed from among the Board as needed. The Board may appoint a Secretary and/or Treasurer from among the general membership of SPA, or these offices may be held by Board members. 1. CONTRACTS. The SPA Board may authorize an agent of the Corporation to enter into an authorized contract or execute and deliver an authorized instrument in the name of and for the Saline Preservation Association. 2. FUNDS. All disbursement of funds will be signed by the Treasurer or an authorized Director of the Association. None of the signers will receive any benefit from the funds. All funds received by the Association will be deposited in the Association's account. The Association will maintain accounts with such institutions as are beneficial in accomplishing the purpose of the Association. by the donor, must be invested by the Board as any prudent trustee might be expected to do. The Board may authorize expenditure of earnings only from such investments for any cause allowed by current law. 4. AUTHORIZATION. Members and participants may act for the Corporation only after authorization by the SPA Board as permitted under these Bylaws. 5. FISCAL YEAR. The fiscal year shall be from October 1 to September 30. 6. CORPORATE BUSINESS. Corporate business decisions and authorization to act can only be achieved by a majority vote of a quorum at a SPA Board meeting, or by a majority vote via e-mail and/or telephone poll of all the Board members, where reasonable. 7. RULES OF ORDER. These Bylaws, and Robert's Rules of Order Newly Revised will, unless otherwise specified, control the conduct of any meetings that may be held. 8. EXPENDITURES. Any expenditure must have the express authorization of the SPA Board excepting for ordinary business expenses. Ordinary business includes expenses of coordination, office supplies, website and maintaining corporate status with state and federal agencies. 9. LIMITATION OF EXPENSES. Any expenses incurred without conformity to these Bylaws and/or to business resolutions of the SPA Board, are the individual's contribution to the Association unless the Association chooses not to accept such contribution. 1. SPA is organized exclusively for charitable purposes within the meaning of Section 501(c) (3) of the Internal Revenue Code. The organization shall not carry on any activities that are not permitted to be carried on by an organization exempt from Federal income tax as an organization described in section 501(c) (3) of the Internal Revenue Code. 2. Upon dissolution and winding up of this organization, after paying or adequately providing for debts and obligations of the organization, the remaining assets shall be distributed to a non-profit fund, foundation or corporation organized and operated exclusively for the purposes specified in section 501(c) (3) of the Internal Revenue Code and which has established its tax exempt status under that section. email, website, and e-forums approved by the SPA Board. The membership database will be kept strictly confidential. 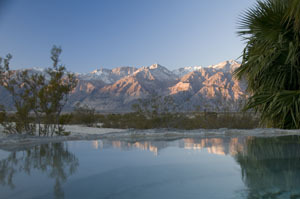 Anyone visiting the Saline Valley Warm Springs assumes liability for his or her use of the springs and surrounding area, including any volunteer activities carried out at the Springs. SPA will pursue a policy of publicity containment, and strive to manage any publicity that would tend to highlight Springs activities and unnecessarily entice the general public. SPA will not support any form of commercialization or non-traditional development within the Saline Valley. These Bylaws may be amended by a concurrence of two-thirds of the membership responding to a Bylaws election.